The Santa Fe Trail ends, of course, in Santa Fe, New Mexico. But where did it begin and why? After all these years of weather and erosion, towns and cities being established, highways and railroads coming through, what sites are still there to see? Where are the best spots to find wagon ruts? What are the most popular sites and towns along the route? Travel along with us as we explore this iconic passage from the lush green farmlands of Missouri, continuing on through the plains and mountains of what was, during trail days, uncharted territory. From the map above you can see that America looked very different back then. Today as you drive along the trail you begin to notice landmarks and changes in the terrain. You can look around and recognize why the wagon trains chose certain paths alongside water sources and how they depended on specific landmarks to keep from getting lost. And all along the way are towns, regional museums and incredible sites to explore. 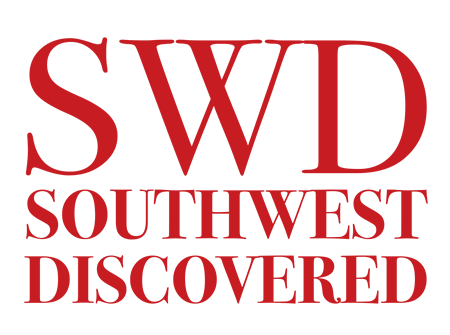 Here we will be sharing our discoveries, favorite places we’d return to again and again, stories of people we meet, and history lessons as we compile our Guide To The Santa Fe Trail. Led by William Becknell in the fall of 1821, the very first party to literally blaze a new trail departed from Franklin with the intention to trade horses and mules, fabrics, axes, tools and household goods with the peoples of Santa Fe. Once sales were complete, they loaded up with exotic Mexican and Spanish goods to trade back home. And this fortuitous opportunity happened because prior to Becknell leaving on his 900+ mile trek, Mexico had just defeated the Spanish winning its independence on September 27 and lifting the Spanish ban on outside trade. There was a great deal of money to be made for skillful traders with the stamina to maneuver such an unpredictable, uncharted journey. Why would someone set out with a small party of only six men, by pack horse, into unknown territory with no defined route of passage and water sources? Debt. Becknell was a merchant and landowner who worked for the Missouri-based sons of Daniel Boone, managed and eventually purchased their saltworks operation (located very near the trailhead) and had gone into debt in his campaign to run for the Missouri Legislature. Motivated to pay off his debtors and avoid jail time, his party left in late September of 1821 and were the first traders to arrive in Santa Fe on November 16. Becknell returned to Missouri having made a substantial profit, paid off his debtors, then led a second round-trip by wagon for yet another hugely successful trade. He became known as the Father of the Santa Fe Trail and his accomplishments started a rush of people headed west in search of fortune, a new life, or for adventure on this newfound trail to prosperity. One could drive right by the site of Franklin, Missouri and never recognize it’s great significance in American history. That’s because the town was founded in 1816 on the banks of the Missouri River in a flood plain, and later in 1827-28 the town washed away in a devastating flood. In fact, Kit Carson lived in Franklin, joined a wagon train west and returned several years later to find that the town was completely gone. Some structures and houses were saved and taken up into the nearby hillsides to establish New Franklin (more on that in an upcoming article). 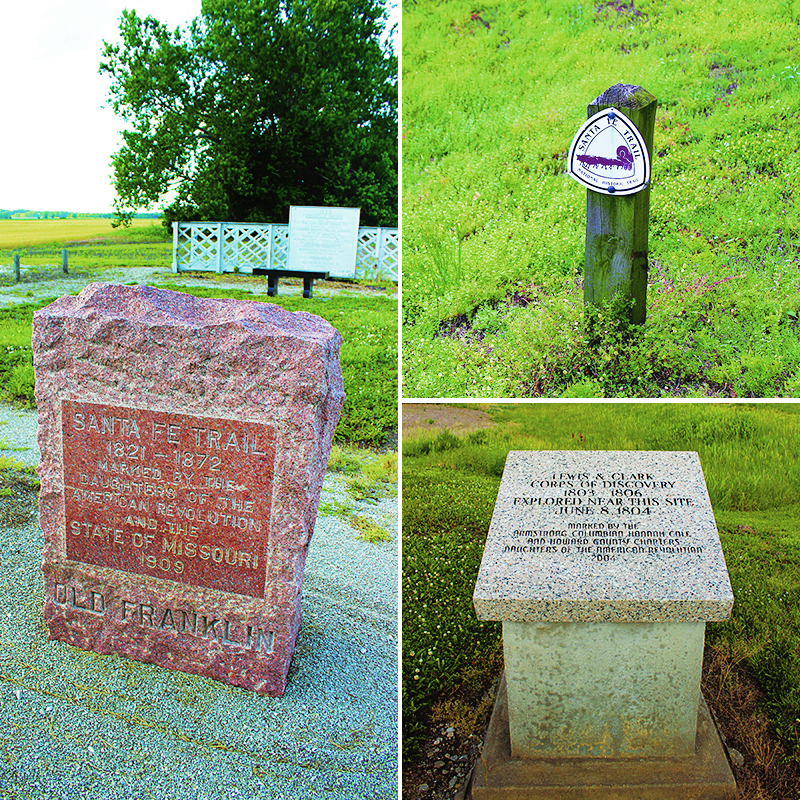 More recently, in the Great Flood of 1993, the Santa Fe Trail marker washed away, and has since been replaced as shown above. Here it is, this is it … you are standing at the trailhead! 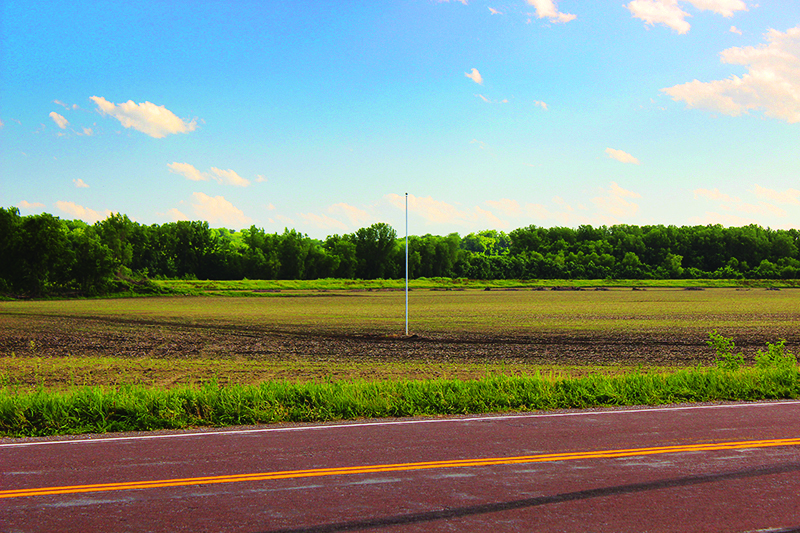 This view is looking across the road from the markers, to an unassuming field where a flagpole marks where the town’s center once was. A flagpole that does not wash away in floods. 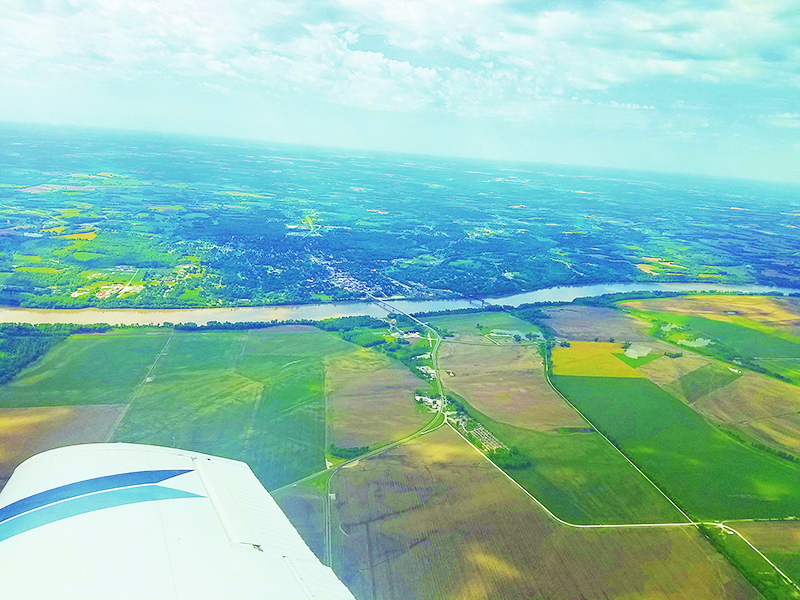 Franklin’s founders chose a beautiful location with rich soil for farming, but as you survey the land it is easy to see the close proximity of the fast-moving river and how low the ground sits in this area that eventually made it a bad spot to build a town. Want to take a drive on the original trail? As you pull out of the parking lot onto this road, turn right heading west. 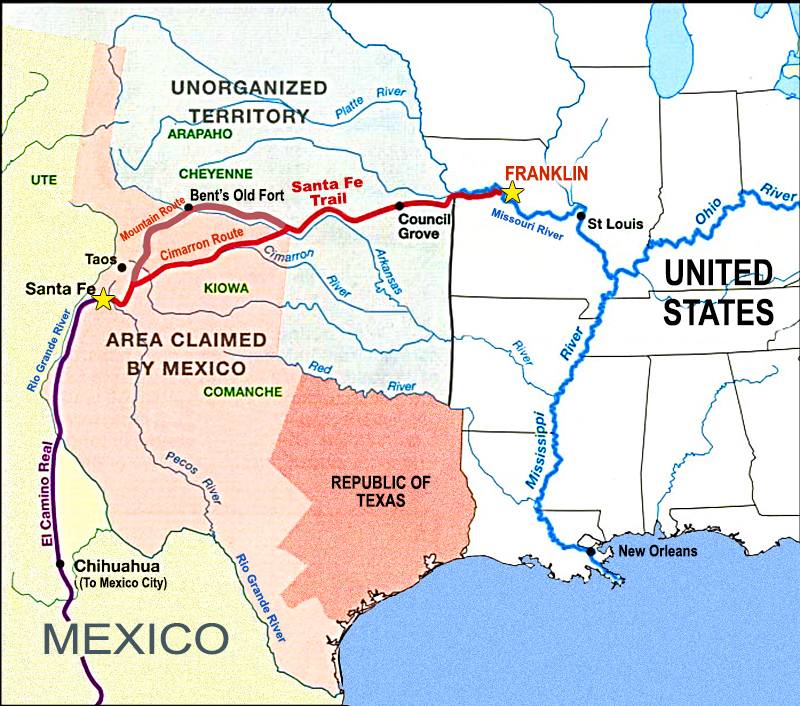 You now are officially traveling on the Santa Fe Trail’s beginning. From Interstate 70, take the Boonville exit and continue north to the center of Boonville on Main Street. Cross the Boonville bridge over the mighty Missouri River. Quickly on your left is the turn off to MO 87. Within a short distance you will find a gravel parking area on your right, with several stone and metal markers. Pull into this lot, park, and look across the road to the flagpole. 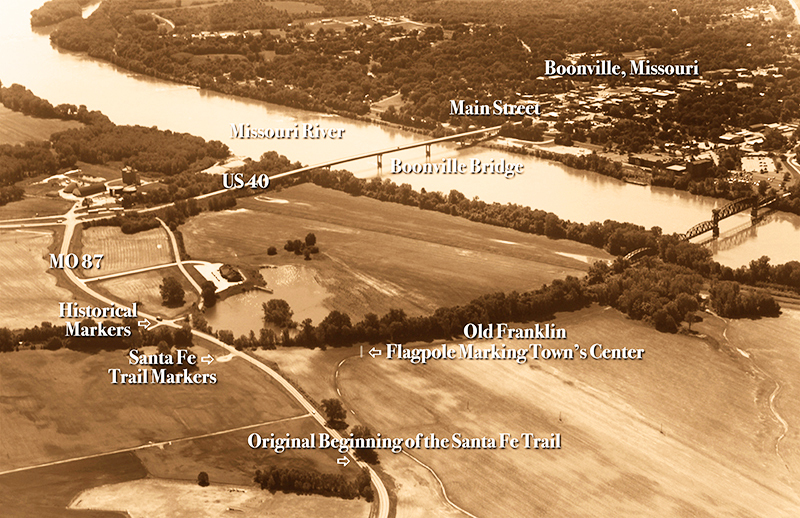 The next stop on the trail from Franklin is Arrow Rock, Missouri, a village seemingly unchanged since the early 1800s, and one of the most popular destinations on the SFT. Always check the Official Santa Fe Trail Association and the Santa Fe Trail Research Site for nearby places, museums, visitor centers and historical societies that may interest you. Boone’s Lick State Historic Site – The saltworks Becknell once managed for the Boone family and eventually owned. Parts of the saltworks mechanism are still there for viewing. Tip: bring mosquito repellant. In fact, much of the trail follows water sources and you will want to have it with you. Arrow Rock, Missouri — one of our Top 5 Must See Sites on the SFT. Article to come! Yes!!! My third great grandparents, Robert Wilds and Frances Fugett, were among the first settlers of Franklin. This article is very informative, and gives a good overview of what the conditions were. Thanks! PJ, coming from you this is high praise. Thank you so much for commenting! I live here in Dodge City Kansas. Some 9 miles West of town the Santa Fe trail ruts are still visible. There is a pull off along the highway and a nice path one will walk to see the ruts. Sometimes easier to see in the fall when the vegetation isn’t covering them up so much. Happy travels to all. James, we find that the Dodge City ruts are some of the most impressive. We’ll be covering your area, along with the ruts in Dodge that were more recently discovered in a residential neighborhood. This fall we’ll be sure to re-visit the ruts west of town to check on their visibility. Thanks for the tip! To help you find your way, just follow the Santa Fe Trail Association’s GEOTOUR! It provides gps coordinates for 73 sites along the Santa Fe National Historic Trail, where you will find not only a historic site, but also a cache with some swag to trade out. Joanne, thanks for the tip. We’d love to write an article about how to use the GEOTOUR. It looks like there are two routes on the trail where it splits in western Kansas. Do you recommend the northern or southern way? Thanks! Drew, the lower Cimarron route was the first taken by Becknell’s party and did not have adequate water sources. The northern Mountain Route was established later and takes longer but there are better water sources. We will be covering the northern Mountain Route first, and then the southern Cimarron after. Both have their own special sites and significance to the trail, and it really depends on the time of year you’re traveling and what your interests are. Your article prompted me to do some investigating of the trail and it IS so much more than a cattle trail. I am enjoying this and will be following along with you from beginning to end. Thank you! Natalie, thank you for traveling along with us. and happy trails! This is amazing! No idea about this trail at all. Thank you! Steve, it came as a total surprise and now is our favorite drive from The SW to the Midwest.